Extremely Dry Weather in the Pacific Northwest Effects the Wild Herbs too! It has been unusually hot here in the Pacific Northwest this Summer. Summer officially started on June 20th, but around here, it normally doesn’t get hot till late July! So when the temperatures are hot and the rain is nowhere to be seen, it also effects all of my herbs that grow here on the farm, cultivated and Wild. Todays Harvest of Wild Red Clover! The season is on for harvesting wild blackberries, wild blueberries, mints: peppermint & spearmint, as well as some other beneficial herbs such as Wild Red Clover! 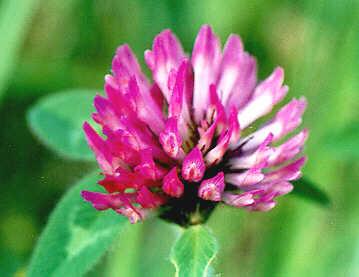 I use the Wild Red Clover in my teas, as well as sell it in bulk. ♦It helps the body get rid of excess fluid, in turn clearing the lungs of mucous. This may be helpful for allergies associated with runny noses and congestion! ♦it improves circulation and helps clear toxins from the liver. This can in turn provide extra energy as the liver is the workhorse of the body that needs all the help it can get! ♦It is also helpful for women who are needing additional estrogen in their body, as it acts this way in the body. ♦In the ways it helps, please consult your Dr. if you are already taking a diuretic or Estrogen replacement. So today, I was excited to get some of the Wild Red Clover picked for drying! You can purchase some already dried in bulk here on my website. You can make the tea in large quantities in a mason jar or get a stainless steel tea ball here on my website to use on a cup-per-cup basis. Please leave a comment answering the question………………..
HAVE YOU TRIED WILD RED CLOVER TEA BEFORE? This entry was posted in eczema, elimination diet, heal your skin, healing with herbs, health wellness, herb harvested, herbal products, herbal recommendations, herbal tea, Uncategorized and tagged hand ahrvested herbs, herbs for allergies, herbs for congestion, honey bee holistics, honey bee holistics herbal teas, natural diuretic, red clover, wild herbs, wild red clover, wild red clover tea. Bookmark the permalink. ← Mint is the refreshing savior during the HOT months of Summer!